Thorneycroft’s most recent body of work is an installation entitled Herd. A major component is the presentation of 150 plastic toy horses (half of which have been altered), ascending a 40 foot ramp. The transformed horses transgress boundaries pertaining to beauty, vulnerability and the grotesque. Herd opened at the Tom Thomson Art Gallery in Owen Sound on April 3rd, 2016, and will subsequently tour to several other venues in Canada. Thorneycroft is the recipient of numerous awards including an Assistance to Visual Arts Long-term Grant from the Canada Council, several Senior Arts Grants from the Manitoba Arts Council and a Fleck Fellowship from the Banff Centre for the Arts. She has exhibited various bodies of work across Canada, the United States and Europe, as well as in Moscow, Tokyo and Sydney., and was a sessional instructor at the University of Manitoba’s School of Art for 25 years. Since 2010 she has been focusing on her studio practice full time, and has gallery representation in Paris, Los Angeles, Detroit, Calgary, Winnipeg, London (Ontario) and Montreal. 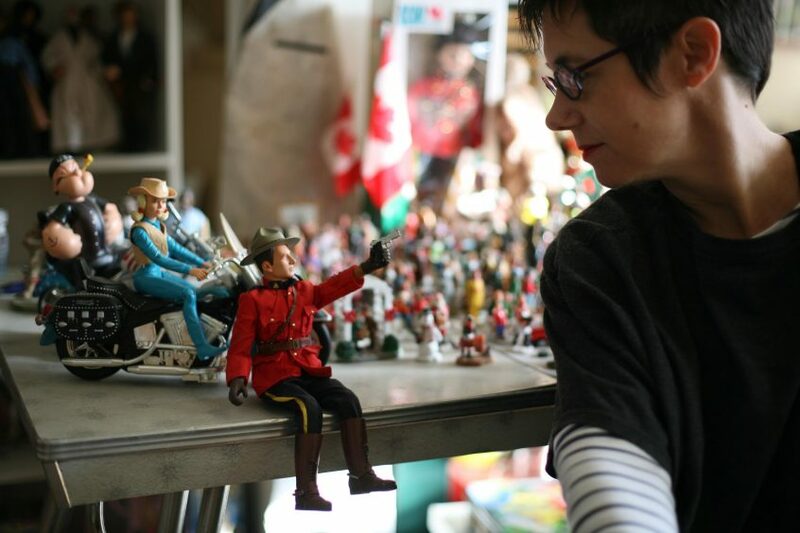 Thorneycroft lives in Winnipeg with her partner artist Michael Boss. Previous Award of Distinction recipients include: Robert Archambeau (2014), J. Roger Léveillé (2012), William Eakin (2009), Roland Mahé (2008), Dr. Robert Turner (2007), Aganetha Dyck (2006), Guy Maddin (2005), Grant Guy (2004), Robert Kroetsch (2003), and Leslee Silverman (2002).